The first seminar of the “Learning from the Past” project successfully concluded! 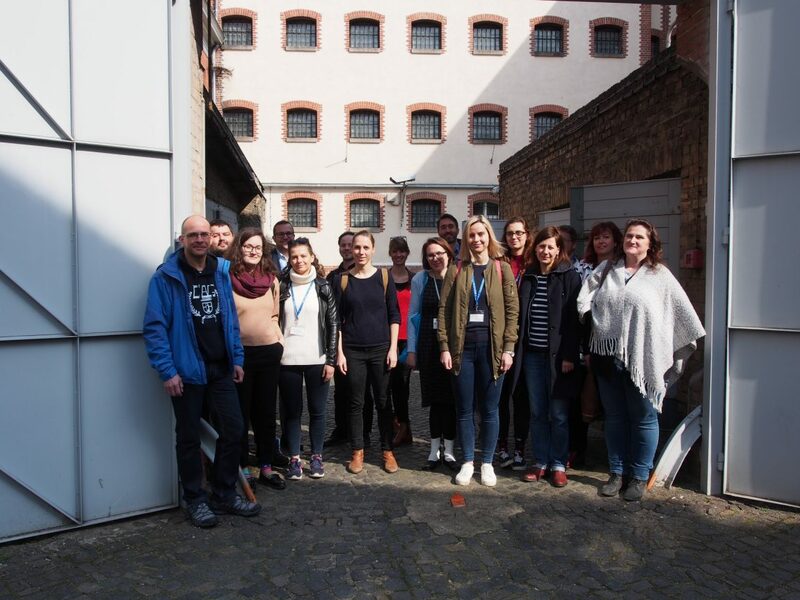 Prague, April 7, 2019 The first seminar of the project “Learning from the Past: How to mediate historical topics in civic education” took place between 1 and 6 April in Potsdam and its surroundings. We visited a number of places of memory with a group of teachers and youth workers from the Czech Republic and Germany and discussed appropriate methods of working with students and young people with local experts. Under didactical guidance, the participants prepared their own projects for educational activities connected to places of memory. The first day of the seminar was dedicated to getting to know each other, introducing the partner organisations and learning about the system of civic education in Germany. The participants received a study material which guided them throughout the whole seminar and which they could use for taking notes of their experience and ideas. The next day started at Glienicker Brücke, a bridge over the Havel river which connected West Berlin with East Germany during the Cold War. We met Ms. Rita Bergemman, an eyewitness who managed to swim across the river in 1961 together with her partner and thus flee to West Germany. Afterwards we visited the Berlin-Hohenschönhausen Memorial, which is situated in the buildings that used to serve as a Soviet special detainment and transit camp and later as a remand prison run by the Stasi, where a number of political prisoners were held. After returning to Potsdam, the participants had a chance to try out the Action Bound app, which can be used as an attractive and interactive way of guiding young people through a certain location. On Wednesday, we visited the Lindenstraße Memorial, a prison and court building formerly used by the Nazis, the Soviets and the Stasi. We met one of the eyewitnesses who was imprisoned here in the 60s and had an exchange with local pedagogical staff about methods of mediating the history of the place to students. The afternoon was dedicated to practical workshops in working with places of memory and to reflections of the previous visits, under the guidance of experts Hana Hlásková (LAkD Brandenburg) and Martin Kríž. The next day was again dedicated to excursions. We spent most of the day at the former concentration camp Sachsenhausen Memorial Site and Museum, where we were guided by a member of its pedagogical staff and had the chance to experience several activities used at workshops for young people and students who come visit the memorial. We also discussed the basic general principles of working with students at such traumatic places of memory. In the afternoon we moved to Berlin where we visited Tränenpalast, a museum commemorating personal stories connected to the division of Berlin. On Friday we visited the last place of memory – the Leistikowstraße Memorial in Potsdam, which used to serve as a KGB remand prison during the Cold War. As in the previous cases, we had a chance to speak to a local guide and pedagogical staff member about the educational possibilities the place has to offer. Friday afternoon was dedicated to reflection and work on the participants’ own proposals of excursions and workshops. On Saturday the participants introduced their projects and evaluated the whole seminar. The second seminar under the project Learning from the Past: How to mediate historical topics in civic education will take place in Jáchymov between 27 September – 2 October. The participants will have the opportunity to visit more places of memory, evaluate the projects they have carried out and get feedback from experts. We will follow up on and further deepen the knowledge gained during the first seminar. The outcome of the whole project will be a brochure dedicated to working with places of memory in education and youth work. It will be available to the teachers and youth workers who took part in the project as well as to a broader public. The project is organized by EUTIS, o.p.s. in cooperation with Association Political Prisoners.cz and BBAG Potsdam. The project is financed by the Erasmus+ programme. We thank the Heinrich-Böll-Stiftung and Czech Centres for kindly supporting the Potsdam seminar.